Discussions Magazine Music Blog: LINDSEY STIRLING/Brave Enough: Available TODAY, August 19, 2016! 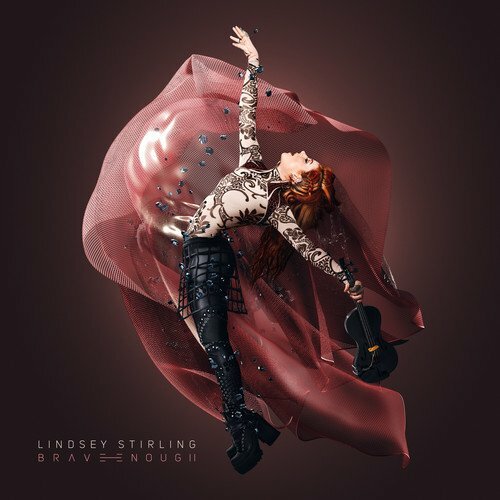 LINDSEY STIRLING/Brave Enough: Available TODAY, August 19, 2016! This highly anticipated release features a number of high profile collaborations including Christina Perri, Dan + Shay, ZZ Ward, Andrew McMahon in the Wilderness, Rivers Cuomo, Grammy Award winning hip-hop artist Lecray, and critically acclaimed electronic musicians/producers Zedd and Robert DeLong. Stirling performs a variety of music styles, from classical to pop and rock to electronic dance music. Aside from original work, her discography contains covers of songs by other musicians and various soundtracks. Her music video, "Crystallize" finished as the eighth-most watched video of 2012, and her cover version of "Radioactive" with Pentatonix won Response of the Year in the first YouTube Music Awards in 2013. Stirling achieved one million singles sold worldwide by August 2014. As of July 2016, her Lindseystomp YouTube channel exceeded 8 million subscribers and over a billion total views. Stirling has been named in Forbes magazine's 30 Under 30 In Music: The Class Of 2015. Forbes notes her quarter-finalist position on America's Got Talent season five in 2010, a No. 2 position on the Billboard 200 for her second album Shatter Me in 2014, and her 8 million subscribers on YouTube. Stirling's debut album was nominated for the 2014 Billboard Music Awards for Top Dance/Electronic Albums. Stirling's second album Shatter Me won the 2015 Billboard Music Awards for Top Dance/Electronic Album. Both albums are now certified GOLD.